A slight detour here just wanted to talk about WordPress development —not actually cutting edge— but since I’ve been working on a few WordPress projects lately I thought I’d share some of my tips, plus remember if you’re good at WordPress you could make a decent amount of ¥¥¥. There are myriads of templates out there with varying difficulties. https://github.com/Obox/layerswp this one is quite unique since it extends the WordPress Customizer. Most of them are already using the Gulp/Grunt combination so if you’re unfamiliar with it then get cracking. The zeitgeist! 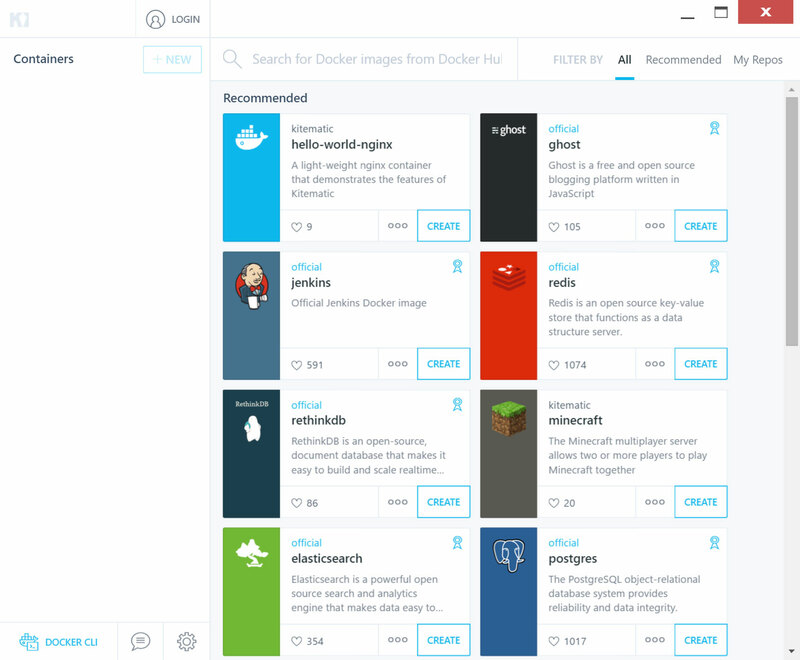 Docker can be seen in every corner at the moment and you can integrate it with any type of application and it’s easy, I had the Tensorflow set up within minutes, although there are a few quirks in using Docker and Kitematic so I recommend you to delve more since you’d be able to debug your environment lest something happens. The first thing you have to do is download Docker Toolbox and Kitematic, you can go to their website and download it like when Windows 95 was still around or use brew cask. And afterward, just start Kinematic up! you’ll immediately be presented with this window. Lovely UI isn’t, this is what sold me the first time! Now that you have everything up and running, the next thing you need to do is to create the docker-compose.yml, start by opening up the CLI (at the bottom left) and type in the code below. And paste this code, I’ve added a very generic comment, again Docker is a broad topic so try to read their website. Once everything has been built, go to the Kitematic window and you’ll see the WordPress container listed, click the setting tab and then Ports, where you’ll find the IP address, click that and it’ll automatically open the WordPress site. Once you finished you can click the stop button on the Kitematic window or start to initiate it. There are alternatives besides Docker that you can choose the easiest one would be MAMP (A slight warning there’re a few system conflicts on El Capitan), another one would be Trellis which is based on Vagrant or if you’re adventurous you could install Centos and, of course, El Capitan comes with its own apache server. The fun part in developing WordPress —well, relatively speaking— would be avoiding all the plugins peril, since a copious amount of it will bog down your site. It’s pretty simple isn’t! Onwards with the code. 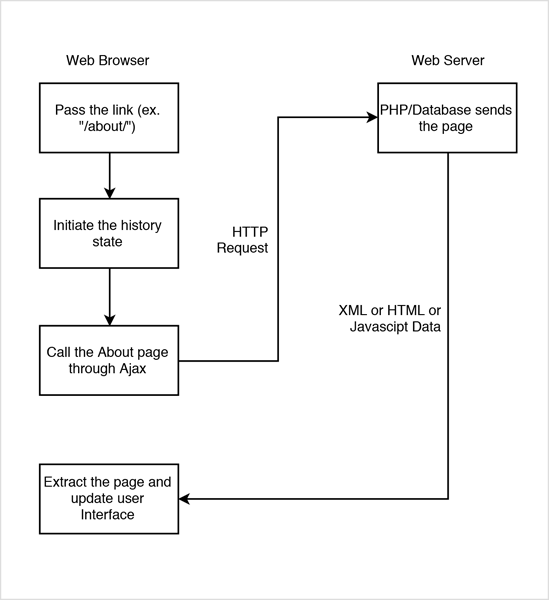 Second, to change the URL path without refreshing the browser, utilize the history data. There’s not much to it, you can read it more here if you want and if you need a fallback you can use history.js. Afterwards, call the page through Ajax. As you can see you probably could merge those two functions together. Once the data is extracted, the next step would be isolating and attaching the HTML content. data = data.split('id="content"'); // the ID name can be anything you want. By using nonce (number used once) your site will be protected against cross-site request forgery. For instance, if we wanted to retrieve a certain post, then we could do something like this. Modify the Ajax call we had earlier. When working with WordPress the first thing that you always need to consider is the security aspect, its ubiquitousness attracts hacks, always follow the best practice (not guaranteed), learn about the basic security hacks, implement re-captcha, update the WordPress constantly, etc. Another note also WordPress is notorious for its sluggishness but then again there is a trade-off that can be had, huge communities, endless plugins (but don’t use it too much), is great for obnoxious client 🙂 , but if speed is what you after then I suggest you try Amplify or Ghost.